I’m not sure if you’ve ever played Mayfair’s DC Heroes Role-Playing Game, but I loved it! I purchased all three editions as they came out; 1985, 1989, and 1993. If you’ve ever role-played superhero games, then I’m sure you feel there was a “magical” system for you. One that sticks out in your memory as a fantastic game system. Mayfair is that system for me! It wasn’t the game mechanics that I loved, it was more about the products and accessories. One of the coolest items included in the DC Heroes box sets were the character cards. 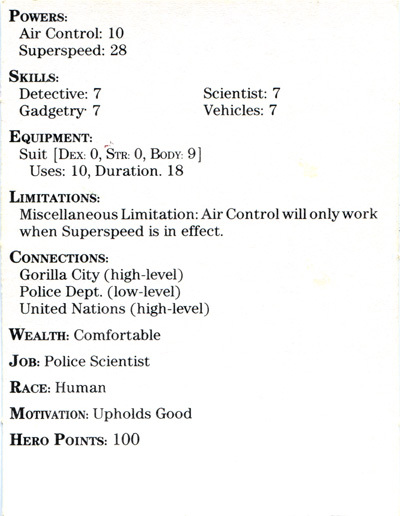 Below you’ll find the Flash character card (front and back) included in the 1985 edition of the DC Heroes RPG. Look at that gorgeous Barry Allen drawing! I’m fairly certain this art is by Jose Luis Garcia-Lopez. Also included in the first edition were small character tokens to be used on maps and such. Below is the token for the Flash. How cool is this?!?! In 1985, I was 13 years old and considered myself to be a pretty big DC fan. I’d seen all the Super Friends cartoons and was collecting a few titles including JLA and Firestorm. When you’re 13, that level of involvement represents real dedication! Meanwhile, DC Comics was publishing the ground-breaking mini-series Crisis on Infinite Earths. I wasn’t collecting Crisis just yet, but had a pretty good idea I should be. Sometime in September, I picked up Flash #350 from a local convenience store. The cover date said October 1985, but titles were always released far before their cover date. I’d had my eye on it for a while, so when I’d finally saved up $1.25 I grabbed the shelf-worn copy. I loved it! I didn’t really understand the entire back story, but that made it all the more interesting to me. I dug it so much, I was planning to get more Flash comics when I had the chance. Then in October, my mother took me to a local comic book store. I had some birthday money saved up, so I splurged and bought the first edition of Mayfair’s DC Heroes Role-Playing Game. I’m not sure the exact release date of the RPG, but I believe it was during the late summer of 1985. The first edition box set came with a few different books. The Gamemaster’s Manual included about 15 pages of statistics on different characters. I devoured this stuff! I couldn’t read the entries fast enough. I was on a knowledge quest to learn everything I could about each hero and villain in the DC universe. WHAT?!?! 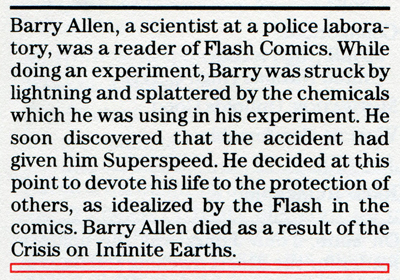 “Barry Allen died as a result of the Crisis on Infinite Earths.” Again, WHAT?!?! It was staring at me from the page, tacked on to Flash’s origin like an afterthought. How is this possible? How could one of my new favorite heroes have died? Superheroes can’t die… can they? And with that, my fragile little comic book world was shattered. Comic book heroes could die. Wow. That changed everything. Not surprisingly I ran right out and bought whatever issues of Crisis on Infinite Earths I could find. When I read Crisis #8, it was heart-breaking. Now it’s possible I’ve got my months mixed up. At the time I was pretty sure the DC Heroes RPG was released prior to Crisis on Infinite Earths #8, thus spoiling a major plot point for DC. Nowadays as I recall the sequence and timing of events, I’m pretty confident that Crisis #8 came out first. Regardless, it was a brutal way to find out about the last race for the fastest man alive. 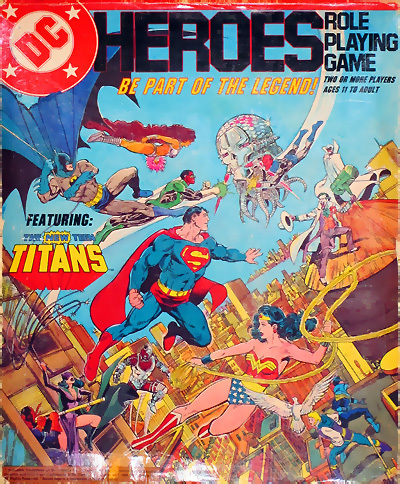 The year 1989 brought a second edition for the DC Heroes RPG. Along with this new edition came new character cards! This time out we were treated to the stats for Wally West as the Flash. 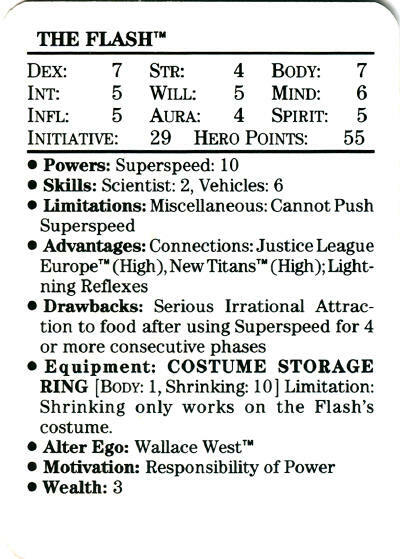 Below you’ll find the Flash character card (front and back) included in the 1989 edition of the DC Heroes RPG. 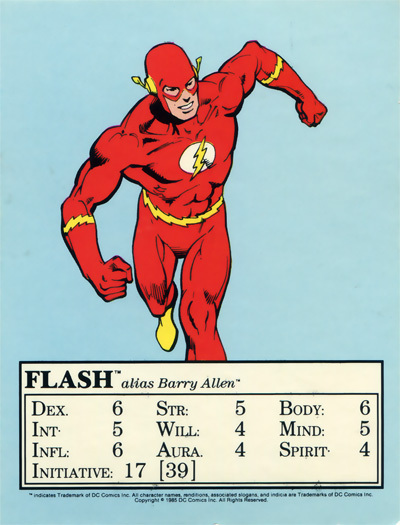 While Flash was included in the 1993 edition of the DC Heroes RPG, there were no character cards. Instead of a box set, Mayfair opted to only produce a softcover book for the third edition. Some eagle-eyed readers may notice that Barry Allen’s Superspeed listed above is ranked at 28, whereas Wally West’s Superspeed was only ranked at 10. Keep in mind, this was not too long after Crisis on Infinite Earths. 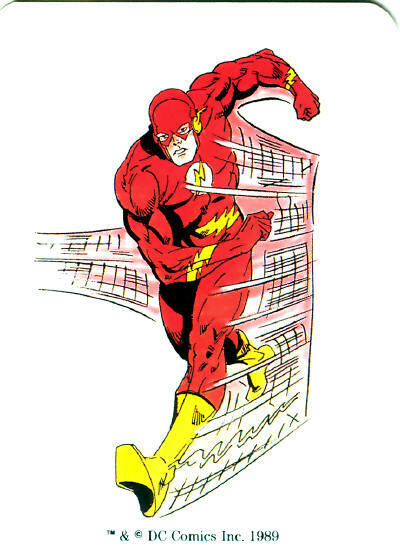 Wally was yet to discover his connection to the Speed Force. By the time the third edition of the RPG was published in 1993, Barry had been reassessed to Superspeed of 25 and Wally had been upgraded to Superspeed 14. If the game had continued, I’m sure we’d have seen Wally’s Superspeed surpass Barry’s as time went by. There are a few different blogs participating in Mayfairstivus over the next week, so check the links below for more festive activities (with apologies to the Costanza family). Many thanks go out to mastermind Frank Lee Delano (of the blogs: Martian Manhunter: Idol-Head of Diabolu, Justice League Detroit, Atom: Power of the Atom, Wonder Woman: Diana Prince, DC Bloodlines, and …nurgh…) for suggesting this celebration! Thanks, Frank! Finally, here are a few previously published Mayfair-related posts by fellow bloggers worth checking out too! If you were a fan of Mayfair’s DC Heroes RPG, be sure to speak up in the comments! The DC RPG was one of the few out there that I haven’t played. Always wanted to though. Good lord, the art on the Wally card is hideously awful and amateurish. That’s so sad how you found out your favorite character died! I would’ve been crushed if I was 13 and found that out. Now I just whine and sulk a lot when I find out a favorite character of mine gets killed off. The art on the Barry Allen token is so elegant, too.